The SSI Extended Range Foundations program provides you with a workshop environment to improve your skills to a high level using Extended Range Total Diving Systems and procedures. All training dives are completed in a confined water environment at depths less than 12 meters / 40 feet. You will earn the SSI Extended Range Foundations recognition card after completing this program. The SSI Extended Range twin configuration Foundations program provides you with a workshop environment to improve your skills to a high level using Extended Range Total Diving Systems and procedures. All training dives are completed in a confined water environment at depths less than 12 meters / 40 feet. You will earn the SSI Extended Range Foundations recognition card after completing this program. The SSI Extended Range program qualifies you to dive to a depth of 45 meters / 145 feet using nitrox mixtures of up to 100%. The program can be completed wearing a complete Extended Range Total Diving System, appropriate for single gas switch, accelerated decompression diving. You will earn the SSI Extended Range certification after completing this program. The intent of the SSI Technical Extended Range program is to provide divers with the training necessary to independently plan and conduct two-gas switch, multiple-stop decompression dives to depths of up to 60 meters / 200 feet, using specialized diving equipment and procedures with an equally-qualified dive buddy. 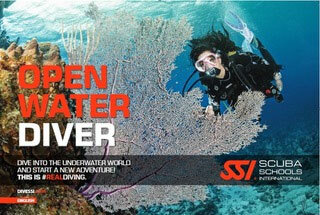 You will earn the SSI Technical Extended Range (with or without Trimix) certification after completing this program. This program provides the knowledge and experience required to conduct limited penetration dives into wreck overhead environments. You will learn how to use specialized buoyancy and finning techniques, lay safety line, and the proper use of lights, while wearing a standard or Extended Range equipment configuration. You will earn the SSI Advanced Wreck Diving Specialty certification after completing this program. Certification Prerequisites: Certified as: Deep Diving, Wreck Diving, EAN Nitrox, Advanced Open Water Diver & at least 24 logged dives. program provides divers with the training necessary to independently plan and conduct limited decompression dives to a maximum depth of 40 meters/130 feet using nitrox mixtures of up to 50% with an equally qualified dive buddy. Upon completion of the program the diver is certified as follows: SSI Extended Range Nitrox Instructor.